On a winter night in February 2009, Colgan Air Flight 3407 crashed just outside of Buffalo, N.Y., killing all 49 passengers and crew aboard and one person on the ground. An investigation by the National Transportation Safety Board determined that the turbo-prop aircraft experienced many factors contributing to the crash, including an aerodynamic stall from which the aircraft couldn’t recover. 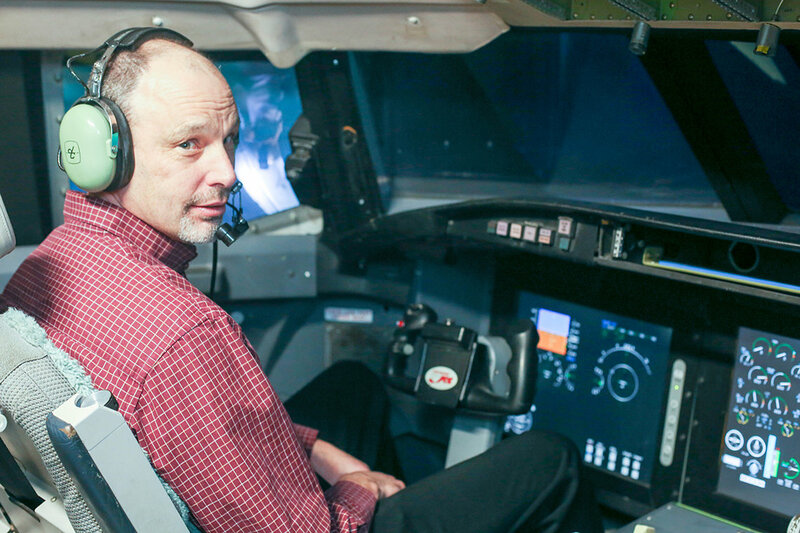 To help improve pilot training – especially as it relates to recognizing stalls and maneuvering out of them – Grant and his research team from the Faculty of Applied Science & Engineering have designed a new methodology that can be used to create new simulations. Aerodynamic stall occurs when the stream of air flowing over an aircraft’s wings becomes separated from the curve of the wing and no longer generates enough lift to counteract the plane’s weight. This is caused by reaching too steep an angle of attack – when the nose of the plane aims up too sharply. When an airplane reaches aerodynamic stall it often begins to roll and becomes harder to control, further complicating the situation for a pilot. Commercial aircraft have various safeguards in place to prevent stall, such as alarms, a “shaker” mechanism or built-in “pusher” system that prompts the pilot to direct the nose down to lower the angle of attack. By lowering the aircraft’s nose, it re-establishes lift, making the airplane easier to control and giving pilots a chance to correct even a severe roll. Some large jets are also equipped with “envelope protection” measures designed to keep the plane flying within safe parameters. But even with these preventative measures, catastrophes still occur such as the June 2009 crash of Air France Flight 447, which killed all 228 aboard. For pilots, manoeuvering out of a stall may not be intuitive in an extremely chaotic situation. Following the Air France and Colgan Air disasters, and several similar incidents worldwide, the U.S. Federal Aviation Administration (FAA) called for researchers from industry and academia to design a new methodology for developing representative models of aerodynamic stall. Grant and fellow researchers answered the call. Their first challenge was a scarcity of data on aircraft behaviour past the point of stall that could be used to build their model. To overcome this challenge, the team worked with Bombardier Aerospace to source data from wind-tunnel testing and from the test flights aircraft manufacturers conduct to have their aircraft certified. These flights are flown by trained test pilots and push aircraft outside of their typical flight envelopes, including stall, to ensure the aircraft post-stall behaviour is manageable. Once they had developed a representative model, they extrapolated two alternate versions: one that simulated a version of aerodynamic stall where it came on more quickly, affecting the plane more severely than the average predicted by the data. The goal was to determine whether their representative model would be sufficient for training pilots past stall. Grant and the team then recruited a pool of 15 pilots – all volunteers from Air Canada, Jazz and WestJet. After being divided into three groups, they were trained to recover from four different stalls in the UTIAS flight simulator. After training, all 15 were tested to study how well their respective training regimens had prepared them. The new simulations for stall recovery are expected to be incorporated into new pilot training programs that the FAA plans to roll out starting in 2019.